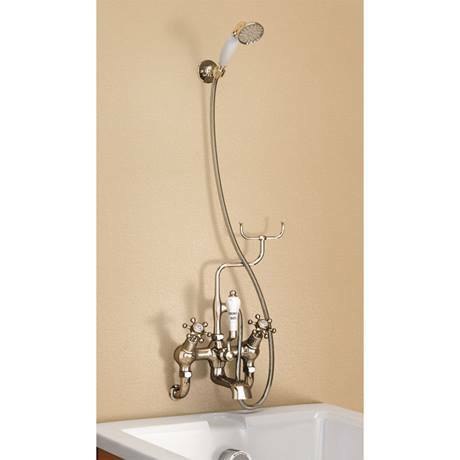 A traditional Burlington Angled Bath shower mixer with Wall mounting unions, Shower hook and Birkenhead tap handles. Create a stunning period bathroom in your home with the luxury wall mounted Burlington tap and shower range. Designed for showering over a bath. The stunning Birkenhead wall mounted bath shower mixer with shower hook is the perfect way to create a traditional theme throughout you bathroom and can make a feature of your bath. It is made from a brass interior making it strong and durable, and has been finished in a chrome polish for an added sense of style.